This black and white lady came from Hector, NY. She had four black and white kittens that were successfully socialized and placed in loving homes. 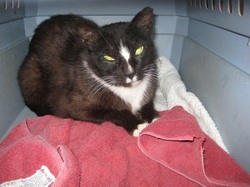 She herself was spayed, vaccinated, and returned to the trailer she was living under. There she has shelter, and a kind-hearted woman to feed and talk to her.